We've already seen what power factor is and what the disadvantages are if it is low. 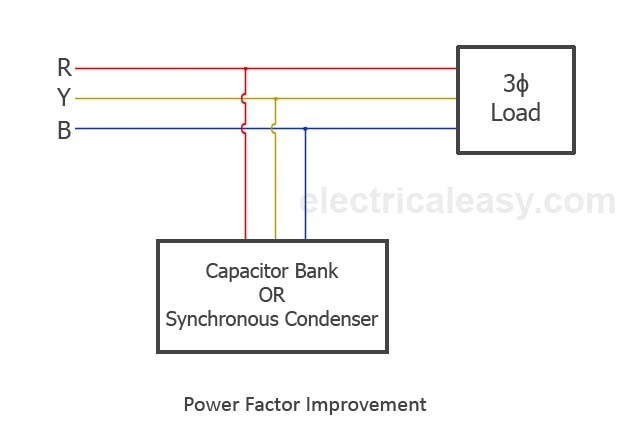 Ideally, power factor should be unity (1). For practical purposes, it should be as close to unity as possible. If it is low, the operation is uneconomical. First we shall learn what causes the power factor (pf) to be low. 90% of the industrial load consists of Induction Machines (1-ϕ and 3-ϕ). Such machines draw magnetizing current to produce the magnetic field and hence work at low power factor. For Induction motors, the pf is usually extremely low (0.2 - 0.3) at light loading conditions and it is 0.8 to 0.9 at full load. The current drawn by inductive loads is lagging and results in low pf. Other inductive machines such as transformers, generators, arc lamps, electric furnaces etc work at low pf too. Today we have interconnected power systems. According to different seasons and time, the loading conditions of the power system vary. There are peak as well as low load periods. When the system is loaded lightly, the voltage increases and the current drawn by the machines also increases. This results in low power factor. The presence of harmonic currents in the system also reduces the power factor. In some cases, due to improper wiring or electrical accidents, a condition known as 3-ϕ power imbalance occurs. This results in low power factor too. 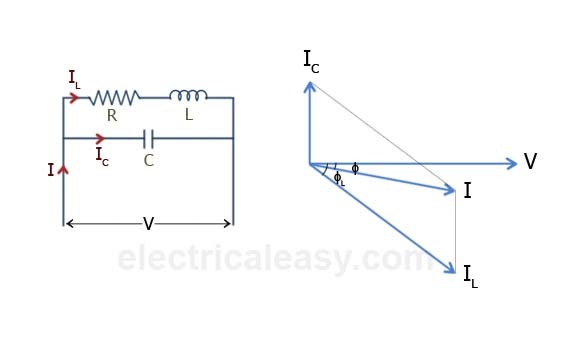 For pure inductance, current lags behind voltage by 90°. For pure capacitance, current leads voltage by 90°. So, the solution is simple. If we use capacitors to draw leading current, we can cancel the effects of lagging inductive current and hence improve the power factor. The above fig shows a common circuit. The R and L are present in all inductive equipments and the C is used for pf improvement. ϕ = phase angle between voltage V and net current I. Based upon this principle, following methods are used for power factor correction (PFC). applied at areas where large inductive loads (lagging currents) are present. Static capacitors are used which produce capacitive reactance that cancels out the inductive reactance of the lagging current. These banks can be star connected or delta connected. A control system is usually provided which monitors the pf and switches the capacitors ON or OFF. When a synchronous motor is over excited, it draws leading current. In a way, it behaves like a capacitor. When such a motor is over excited and run at no load, it is called a Synchronous Condenser. The most attractive feature is that it allows stepless pf correction. In a static capacitor, the leading kVAR supplied are constant. But in a synchronous condenser, we can vary the field excitation and hence control the amount of capacitive reactance produced. Synchronous Condensers are used in large factories, industries and major supply substations. Synchronous motor is not self starting, so auxiliary device is needed. We know that stator winding draws lagging current in a motor. This current is drawn from the main supply. Hence, to improve pf, we supply this lagging current from an alternative source. This alternative source is the phase advancer. A phase advancer is basically an AC exciter. It is mounted on the same shaft as the main motor and connected in the rotor circuit. It supplies exciting ampere turns to the rotor circuit at slip frequency. This improves the power factor. Another attractive feature is that if we supply more amp-turns than needed, the motor will operate in an over excited state (at leading pf). Lagging kVAR drawn by the motor are reduced because the exciting ampere turns are supplied at slip frequency. Credits for the Graphics: Kiran Daware.